The 1979 Honda Goldwing for Sale is a very nice old motorcycle, desirable according to collectors of old Honda motorcycles, that has just been left sitting idle for about twenty (20) years, un-ridden and not being used at all. The 'wing's motor is not locked up. and then come back and make me a good (read: not insulting) offer for the old motorcycle. The engine is still good and I'm willing to take offers for it. This old Honda motorcycle for sale is one that you still see out and looking good on the highways; make me an offer! 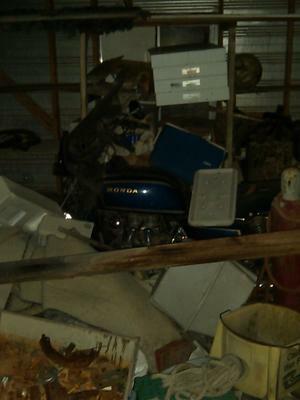 The 1979 Honda Goldwing for Sale is in Kent, TX Texas USA and I'm taking offers just to get it out of of my garage! If you want to make a bid for this vintage Honda Goldwing, send me an email using the comments form provided by GoGoCycles Used Motorcycles for Sale.